Alder at Vinography.com - a very well respected and written blog gave us a nice write-up and review. Here are his comments on our 2003 - to read entire article please click on the title above. We appreciate your support!! A medium garnet color in the glass, this wine has a candied nose of blueberries, and blackberries with a slight piney note to them. In the mouth it is medium bodied with a nice mouthfeel and excellent acidity. This acid, coupled with a nice, light tannic structure keeps the blackberry flavors from becoming too jammy (it probably helps that someone didn't let the grapes dry out too much on the vines) so that the overall wine has a lighter, less common style for Sonoma Zinfandels. The finish is moderate in length and pleasant. Food Pairing:This is a great wine for grilling -- I'd love to drink it (just slightly chilled) with grilled sausages on a hot day. It is May and the vines are growing. The season got off to a late start given all the late spring - specifically April - rains we had this year. It was a wet one - at our ranch we totaled over 88 inches of rain. Everything held up fine though. 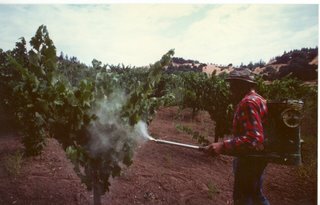 We have just started suckering our old vines - we go through and remove any unwanted shoot growth - this concentrates the growth with those shoots that have clusters and ensures good ripening and fruit exposure. We will also be sulfur dusting the vineyard - this is an organic way of preventing any powdery mildew developing on the vines [the picture is of my grandfather - Louie - dusting by hand in the 1970's] On our young vineyard - the new vines are just growing from a long winter. We are training them up the stake now - the first 3 years of a vines life are the most important - a little like raising a child - they need good roots. 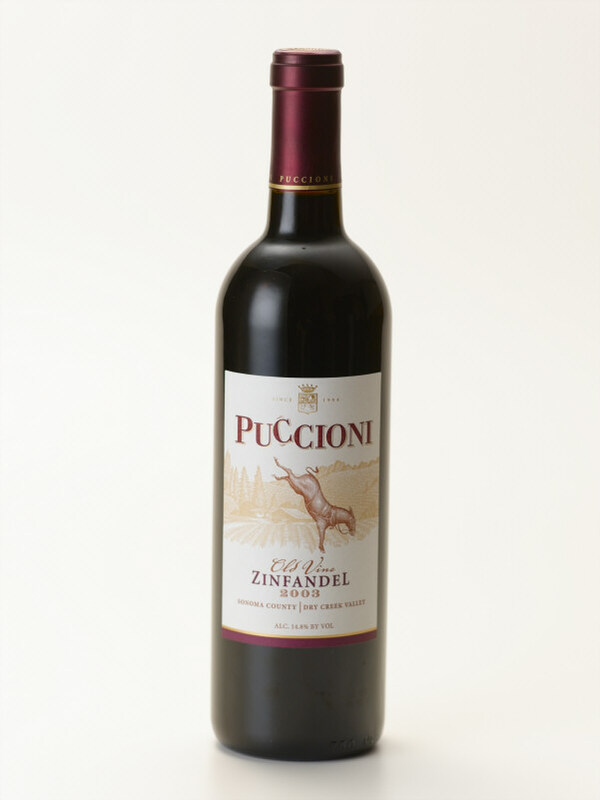 The 2004 Puccioni Old Vine Zinfandel is slowly bottle aging and we expect to be releasing it at the end of June or mid July. IT IS ALMOST READY!! We are very excited about the wine - it has great concentration and intense rasberry/blackberry fruit. If you have signed up for the Puccioni Mules we will let you know when it is ready. If you have not - go to our website www.puccionivineyards and sign up for the "Puccioni Mules". You can pre-order the 2004 now by also going to our site. Thank you to all for your support!! We will be doing a few Puccioni hats and shirts - let us know if you are interested and we can make them available to all.